Lime Marmalade is my favourite preserve to make and is always delicious with a beautiful tang and slight bitterness, which all of the best marmalades have. 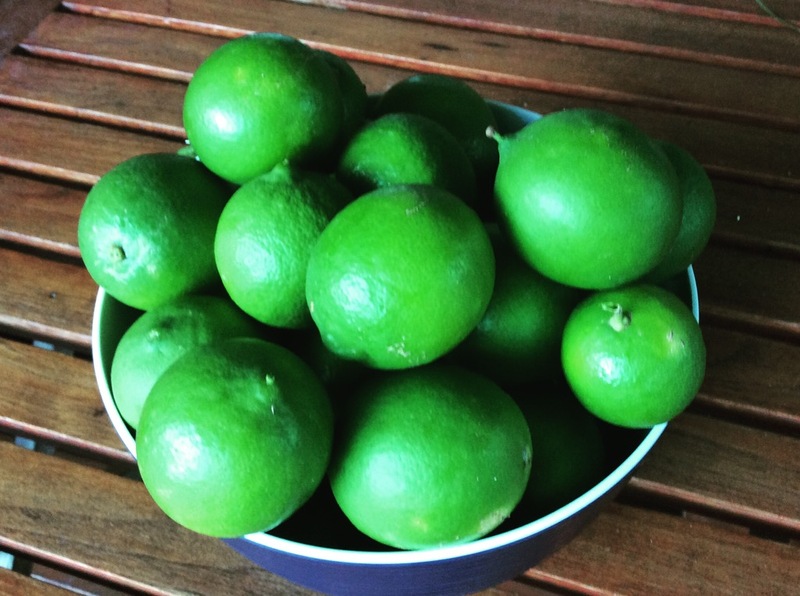 Limes are plentiful right now and at the peak of their season in mid Autumn. My lime tree was bursting with fruit, and the crop was the best I’ve seen. 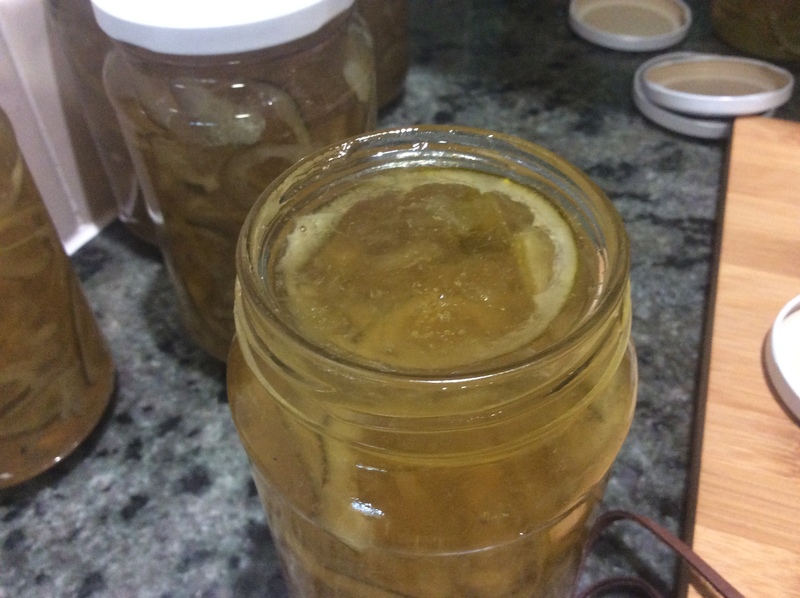 Lime marmalade is relatively uncomplicated to make with no seeds to deal with, and a good one to start with if you haven’t made marmalade before. All you need is limes, sugar and water. 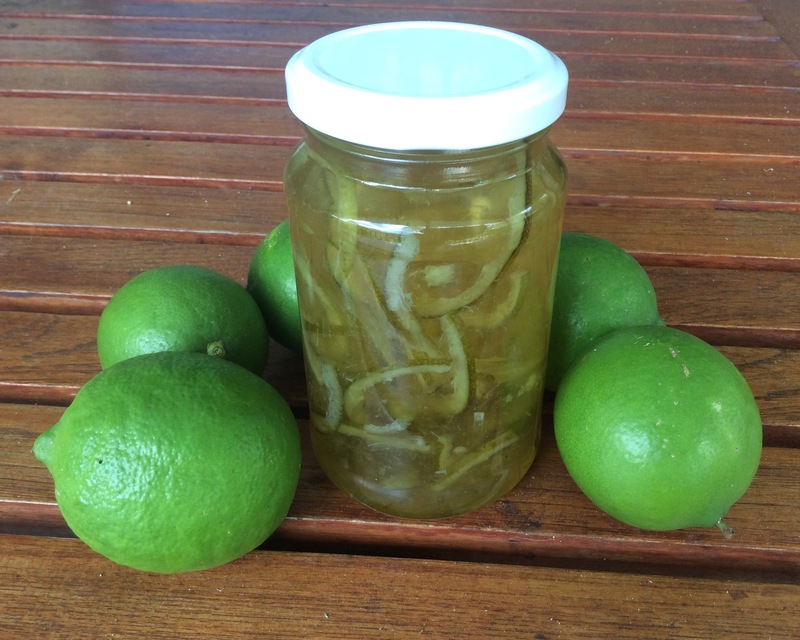 I started with around a dozen limes, but you can successfully make lime marmalade with half that, and this recipe is very flexible. If you are a beginner, it is best to start with smaller batches, rather than one large one. 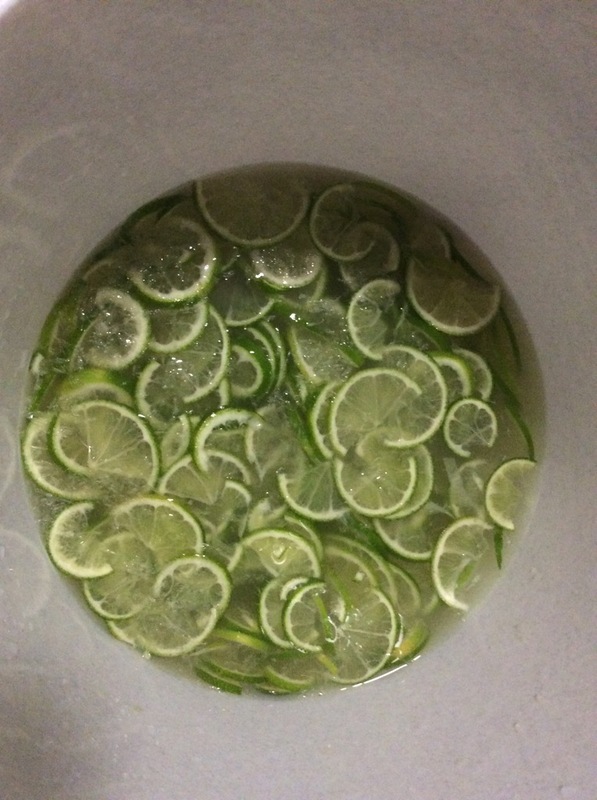 Top and tail the limes, cut into half longways, and thinly slice. For Show work, you need to slice very finely. Put the lime slices in a large container, just cover with water and soak (covered) overnight or at least three to four hours. 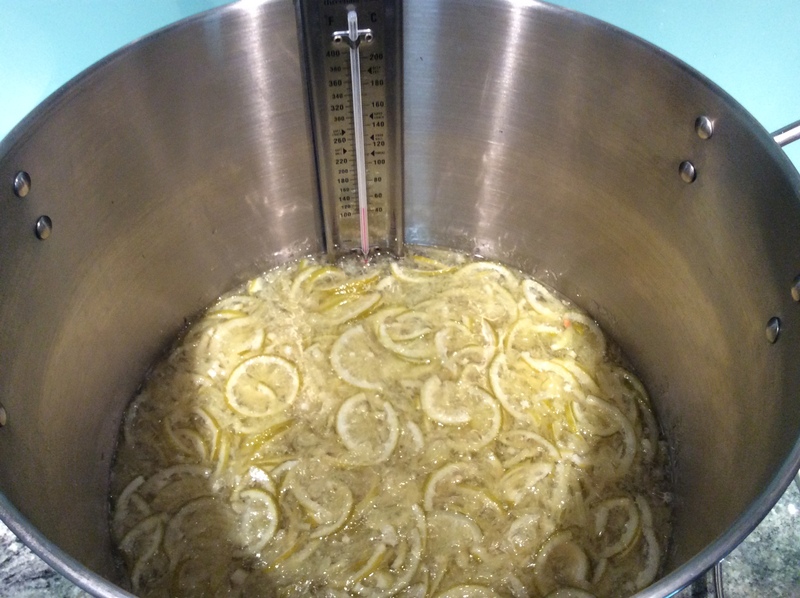 Next, put the limes and soaking liquid in a large pan, bring to the boil and simmer (covered) for an hour. This is an important step to soften the peel, which will not soften any further once you add the sugar. If you want to be sure of how much sugar to add, test for pectin (1 teaspoon mixture to three teaspoons methylated spirits), and tip the mixture onto a white saucer. If you have large clots, add the sugar cup for cup. If smaller (which is unlikely as limes are rich in pectin), you should add less sugar, closer to 3/4 cup sugar to each cup of mixture. In this case I added the same amount of sugar to the pan as the lime mixture. Note: you will be adding a lot of sugar, but this is important as it preserves the mixture, and fortunately you only eat a small amount of the marmalade at at time! 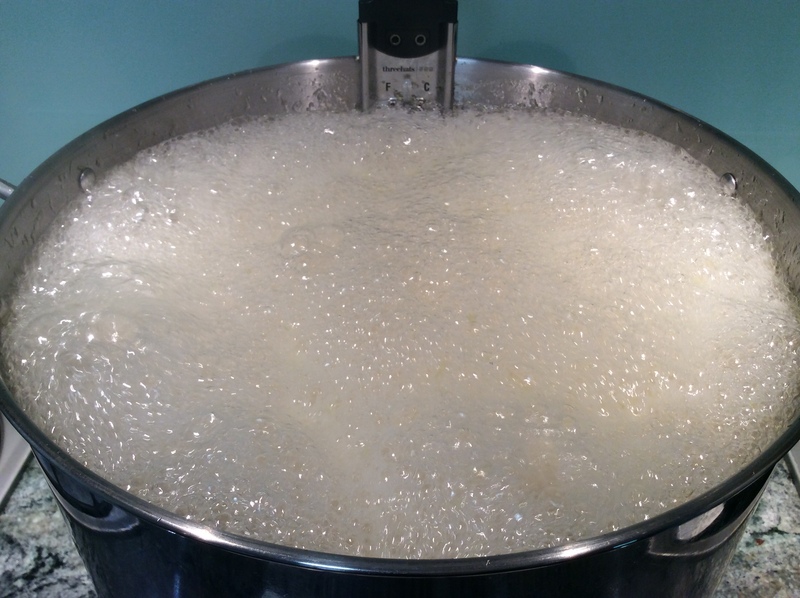 After adding sugar to the pan, add your candy thermometer (if you have one), and turn on the heat, ensuring that you allow the sugar to fully dissolve before it comes to the boil. At that point, boil the mixture rapidly until it comes to setting point, which is 104 degrees. The mixture at that point will come to a rolling boil, and will spit. You can also test for set using a small amount on a cold plate which will wrinkle, or use the spoon test, where the thickened mixture will “sheet” off the spoon. Watch the pan carefully at this point, as it will have a tendency to boil over. If this happens, when you are finished, add water to the spill and it is easy to clean up. When the mixture reaches setting point, take it off the heat and allow to sit for 15 minutes so that the peel will distribute evenly. Don’t leave it too long, or the marmalade will jell in the pan. After letting it sit, take your heated jug and sterilised and heated jars, and carefully pour the marmalade into each jar using oven mits and protection. Fill each jar to the top and seal immediately with the lid. Finish filling all of the bottles and don’t move them until they are cold, so that the marmalade can properly set in the jar. I made around a dozen bottles from this batch. 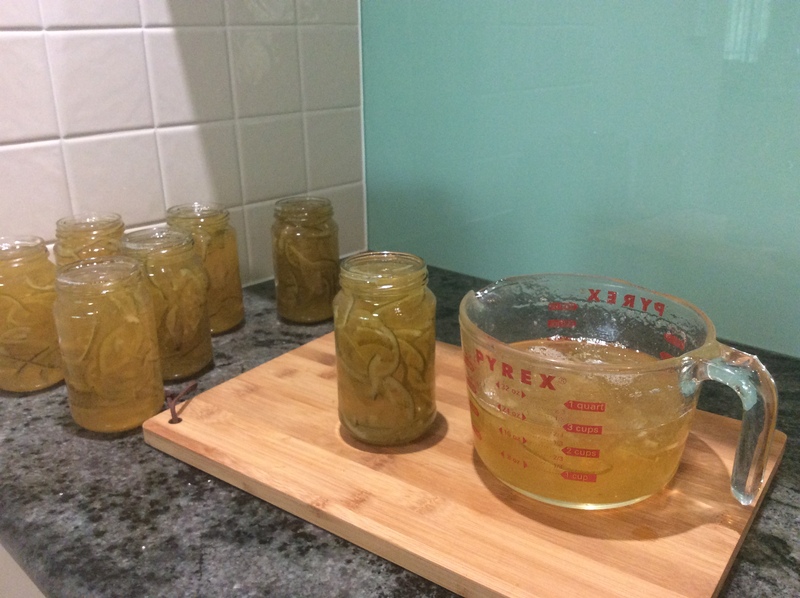 If properly prepared and sterilised jars are used the marmalade will keep for 6-12 months. Enjoy!